People won't miss you if you're wearing a red suit. One of the oldest colors in the history of mankind that garments were made in for solely visual impact is the color Red. Ancient tribes used to adorn themselves with their skins that were dyed red using berries to create the pigment. Red has always been the symbolic color of blood and is still a color that everyone understands. Fast forward to modern times and suit fashion. Guess which color often is seen first by most, Red. Wearing a Red suit is something that can only be done in completely casual celebratory or party circumstances. It's the color that makes you stand out. 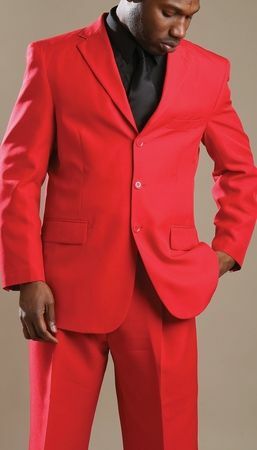 A red suit is usually bought for Halloween parties to dress in a particular costume like devil, pimp or just looking outrageous. 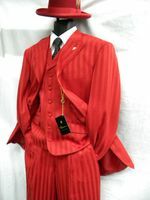 Singer and Entertainers world wide also like wearing red mens suits when they perform because red is simply a color a that provides them with maximum visual impact. How many times have you seen a Temptations or Four Tops tribute show where a Red suit were worn by at least someone in the group. I've been on countless cruises and vacations where I always seem to end up at these shows. I guess I just like those fantastic songs. Red suits or shirts are worn almost always. A red suit just looks amazing on stage and really work under the spotlight. So if being noticed is your priority for a fun party or being on stage, consider getting yourself a red suit and watch all the eyes on you.